Working-class families with deeply rooted Italian, German and Polish heritages, a burgeoning Hispanic community, and a new urban creative class form the patchwork neighborhood of Highlandtown. A rowhouse neighborhood adjacent to Patterson Park, Highlandtown was once home to Eastern European immigrants and working class Baltimoreans who worked at thriving manufacturing and port jobs along the Inner Harbor. New generations of these families still call Highlandtown home, but in recent years Highlandtown has also welcomed Hispanic immigrants and urban professionals and artists, thanks to its designation as an arts and entertainment district. Highlandtown residents can walk to farmer’s markets, shops, restaurants, libraries, nightlife and parks, making it ideal for urbanites who embrace the convenience and abundance of city living. Highlandtown sits on a hill that slopes up and east from Patterson Park. Its side streets, some of which offer panoramic views of the downtown skyline, are lined with classic Baltimore rowhomes, built in the 1920s. The neighborhood is steps from Patterson Park and Fells Point and adjacent to the Canton and Patterson Park neighborhoods. Highlandtown’s “Main Street,” a busy corridor called Eastern Avenue, is the hub for many new and longtime businesses. Since 1943, Matthew’s Pizza has served Baltimore’s best deep-dish pizza. Newcomer North Pole Ice Cream scoops globs of rich ice cream in a funky bright blue building. High Grounds supplies a coffee buzz to creative types who frequent neighboring Creative Alliance at the newly restored Patterson Theater. The Creative Alliance offers an original and funky arts and entertainment experience and classes for artists, writers, musicians and children. 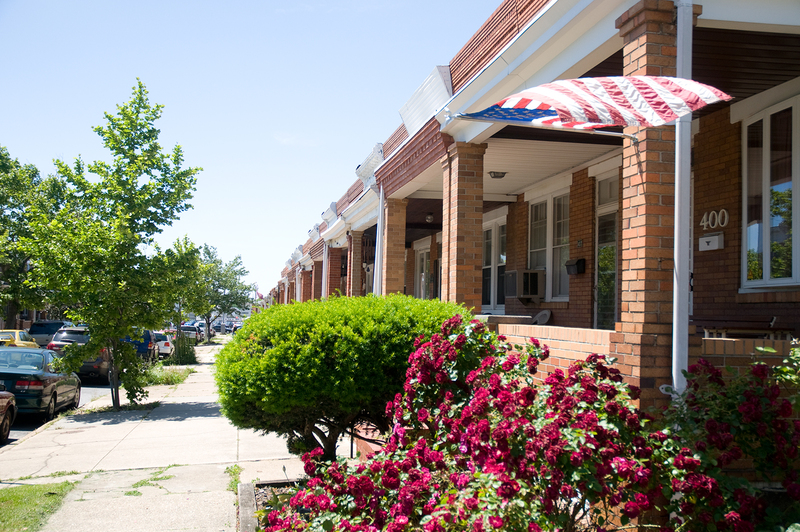 The Greektown community is a traditional yet up and coming neighborhood that has been a major destination of SouthEast Baltimore for decades. Greektown offers the best elements of any Baltimore neighborhood; safety, close proximity to major highways, a great school, strong churches and a charming business district thriving with Greek flavor. Residents of Greektown are fortunate to have the SouthEastern Police District and Johns Hopkins Bayview Medical Center within its borders. Greektown is also undergoing numerous exciting major commercial and residential development initiatives that will add to the vibrancy of the community. Greektown is comprised of a great mix of cultures and working class that has recently become a growing destination of the young professional.